The closure of the only abattoir dealing with cattle in Pembrokeshire has been a "huge blow" to the industry, farmers have said. The company behind the abattoir in Haverfordwest, Emcol 2008 Ltd, collapsed in January 2016 with debts of £660,000 to more than 230 creditors. One director said it was due to escalating costs and being owed money. Newport dairy farmer John Sollis called it a "disaster" for people in the area who were owed money. Documents lodged on the Companies House website show one livestock trader is owed in excess of £107,000, while others are owed significant five figure sums. In his report, liquidator Gary Stones said any payments to unsecured creditors were "totally dependent on the collection of the Irish book debt". The report indicated almost £470,000 was owed to Emcol by an Irish firm. Mr Sollis, who is owed almost £15,000 by Emcol, said: "It was a disaster in a sense the amount of money that people have lost in the locality and not now having a local abattoir to move stock to or casualties. "Casualties and stock have to go further afield and that's costing us money." 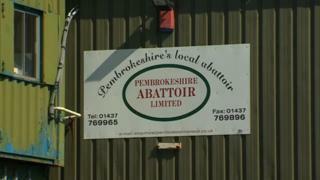 The nearest abattoir is in Cross Hands, Carmarthenshire. NFU Cymru President Stephen James is owed just over £1,000 and said the loss of the abattoir was a "huge blow" as it dealt with injured cows. He said injured cows now had to be shot on the farm premises, resulting in a loss for farmers. One of Emcol's directors, Helen Lewis, said the collapse was down to a "very significant amount of money" owed to the company by an Irish firm, and the "escalating costs of running an abattoir". She said she had "every sympathy" for farmers who had lost out and "she knew many personally".